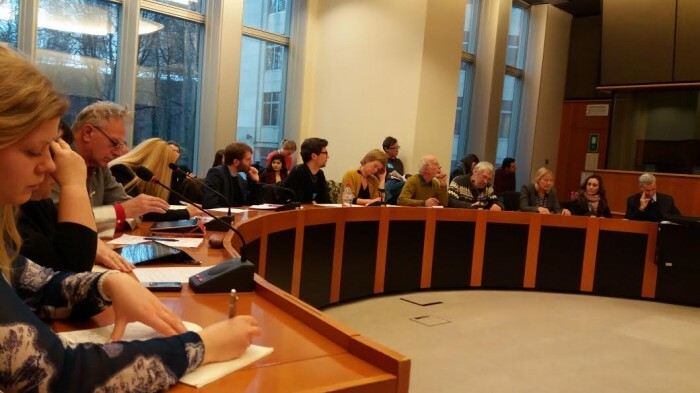 On the 1st of March, a combination of representatives of the mainstream parties of the European Parliament -the Alliance of Liberals and Democrats for Europe, the European People’s Party, and the Socialists and Democrats- hosted a public hearing on an unprecedented topic. 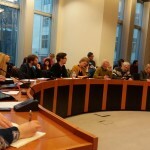 Following previously published research by ECCP on the question of Israeli military entities receiving funding from the European Union through the funding programme Horizon 2020, concerned MEPs consented to host this initiative to further investigate the legality of this funding. The aim of the hearing was to discuss the various questionable projects, investigate the possibility of dual-use technology, and to suggest possible ways of moving forward through an open discussion. 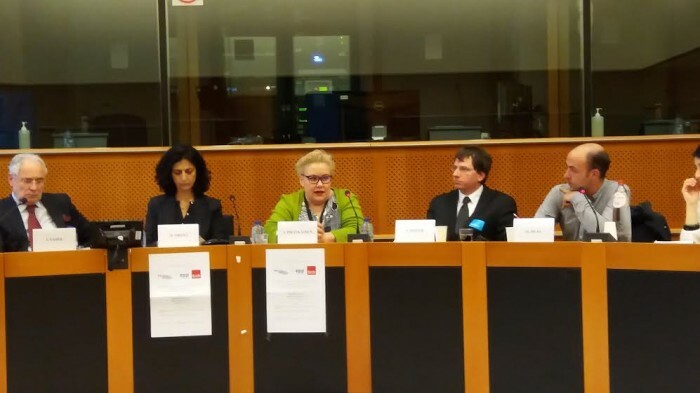 Moderating the hearing was MEP Maria Arena, who was joined on the panel by MEP Ivo Vaigl, MEP Sirpa Pietikainen, Israeli economist Shir Hever, and Michael Deas from the Palestinian-led BNC. 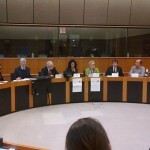 The conference began with some introductions of the topic, and an explanation of the cause for concern. 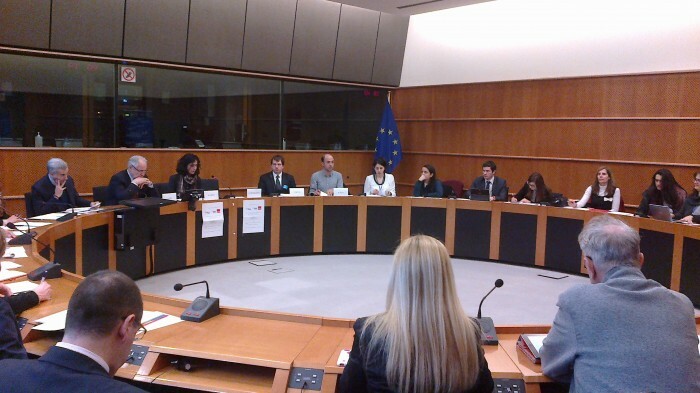 The “responsibility of the EU to uphold its legislation” seemed a key issue for Mr Vaigl and Ms Arena, and they both stressed how “important and worthwhile it is for us to address this topic”. Mr Hever provided some economic context, and Mr Vaigl agreed that the EU’s foreign policy should remain consistent with its trade policies. Mr Deas focussed specifically on the violations of international law involved- the problem with funding weapons industries that are currently engaged in gross human rights violations. 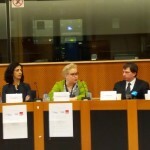 Following these introductions, the floor was opened, and MEP Marita Ulvskog began the discussion by shedding some light onto the procedure that had preceded the finalisation of the plans for Horizon 2020. 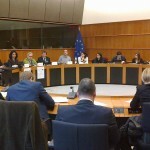 Some important questions were raised, such as the question of the clarity of the rules of the funding programme; whether or not dual use technology is expressly forbidden; if the current work of Horizon 2020 falls in line with the most recently referenced EU policies towards Israel, especially with regard to non-recognition of Israel’s sovereignty over the Palestinian territories; and which course of action should be taken in order to address any violations. Following about an hour and half of discussion, an observer of the hearing, Mr Ran Arad, from the Israeli Ministry of Economy spoke up. 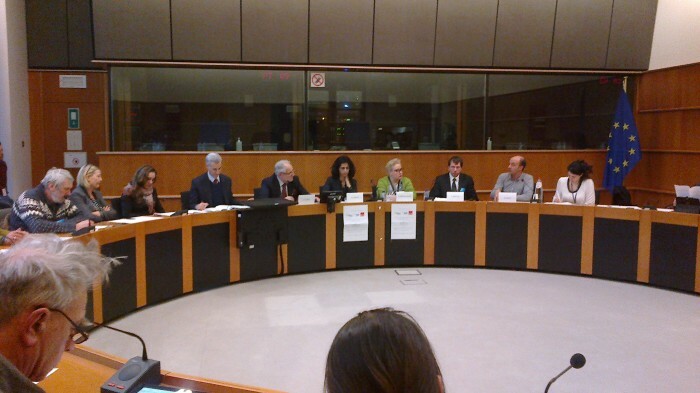 He told the room that Israel and the EU have been associated for twenty years now, and that the projects for Horizon 2020 were chosen based entirely on merit. He pointed out that there are many military companies in the world that receive funding, such as Saab (etc. 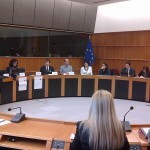 ), and argued that dual use technology is the way of the world. He also added that some of the projects are obviously only for civilian purposes, so why put all Israeli projects in the same box? Ms Ulvskog was the first to respond to Mr Arad’s comments. She first thanked him for speaking, as she mentioned that it is unusual to actually receive a response from an Israeli body about any of these issues. In her reply, she referred to the comment about dual-use technology being ‘the way of the world’; she underlined the fact that conversation was not about the morality of the arms industry, and instead about specific companies that commit human rights violations. Ms Ulvskog also added that in reference to the Swedish company Saab, as a company that receives funding, the point is that Sweden is not occupying and bombing Finland. 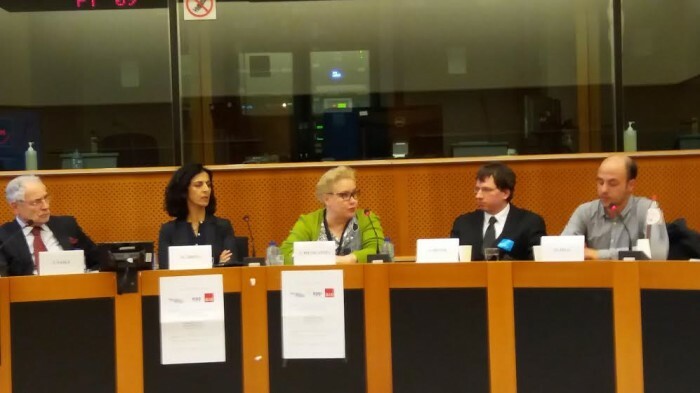 Mr Hever agreed that there is also a need to investigate further any participants in EU funded projects that may be committing violations, but reminded the room that Israel, as such an obvious example, would very much be a gateway into ensuring a transparent process overall. 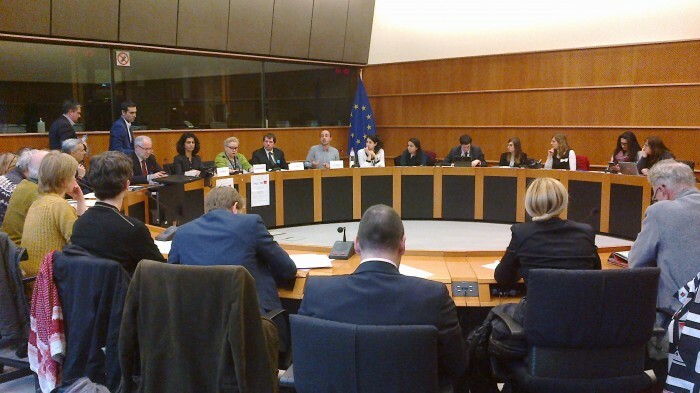 Another observer of the conference was a former rapporteur to Horizon 2020, MEP Christian Ehler, who defended the program. He stated that there is no evidence of military use, no research conducted in the Occupied Territory and that there have been no violations. 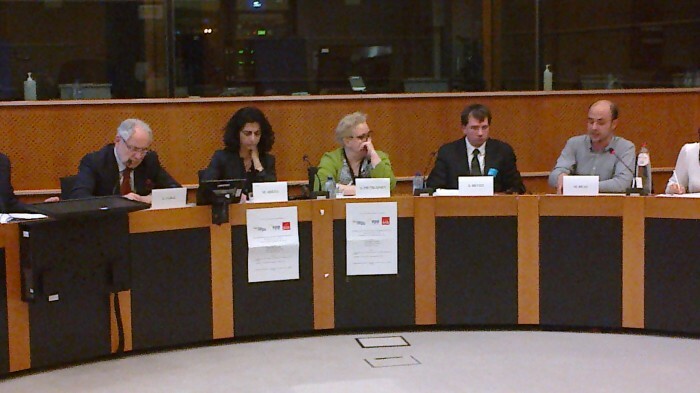 Mr Ehler then spoke extensively about Israel’s position as a strategic partner of the European Union. 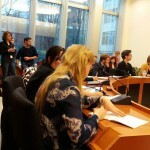 The hearing was concluded with some comments from the speakers. 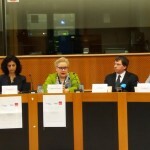 Ms Pietikainen had concluded her comments earlier with an expression of support for the further investigation of the topic, and Mr Vaigl suggested that the way to move forward was to ensure that as a strategic partner to the EU, Israel should be criticised as any country who leaves the boundaries of international law, without it being interpreted as an attack. He also referenced the issue that the extremity of the situation in Israel means that it is now filling all of the criteria necessary to define it as an apartheid. 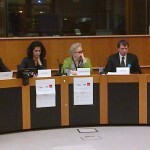 Mr Deas and Mr Hever made some concluding remarks and suggestions for the next steps to investigate further the EU’s support to Israeli military companies, and Ms Arena finished the session by expressing her agreement with the general consensus that this issue was one that needed to be thoroughly investigated. 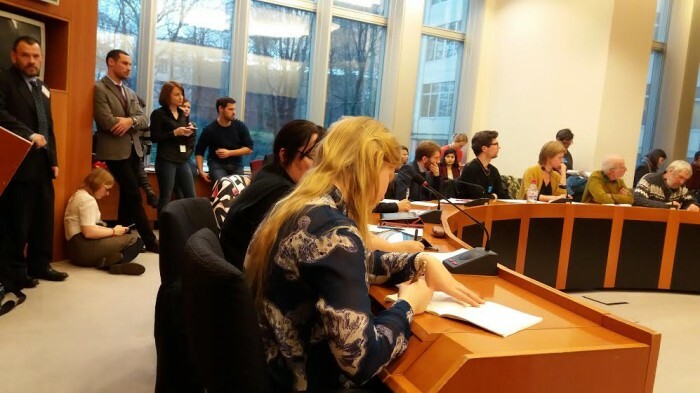 It is worthwhile noting that the ITRE Committee from the European Parliament, the Horizon 2020 department of the European Commission, the Israeli Mission to the EU, the Israeli Embassy, and the Delegation for Relations with Palestine were also represented.